We are a married couple from Finland. We wanted to fulfill our dreams by traveling without an end-date. We are minimalist travelers looking for happy state of mind. ​ Gathering information, reliable tips and experiences about backpacking and traveling on a budget is our passion. We want to combine information on our page, and we thrive to find fellow travelers to share their stories with us. Welcome to join our journey! 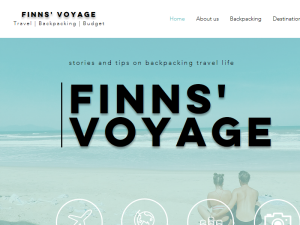 This what your FINNS' VOYAGE Blog Ad will look like to visitors! Of course you will want to use keywords and ad targeting to get the most out of your ad campaign! So purchase an ad space today before there all gone! If you are the owner of FINNS' VOYAGE, or someone who enjoys this blog why not upgrade it to a Featured Listing or Permanent Listing?